Tears were definitely shed a few months ago when Wolf Parade, the Canadian indie-rock super group fronted by Handsome Furs leader Dan Boeckner and Frog Eyes/Swan Lake/Sunset Rubdown member Spencer Krug, announced they would be going on an indefinite hiatus following the conclusion of their most recent tour. But after having given their latest release, Expo 86, a thorough listen, I have to say the move to call it quits, at least temporarily, seems appropriate, if not outright wise. For while Expo 86 is at points quite good, even great, and while, as the album's interior artwork implies, it rocks harder than anything Wolf Parade has done before (despite an expanded reliance on synths)...it's clear that following on the heels of '08s just okay At Mount Zoomer , whatever quirky magic the band once captured in its beloved '05 debut Apologies To The Queen Mary is gone. Throughout, Expo 86 has a forced, muscled-through, workman-like feel, as if none of the songs came together easy and it took every ounce of creative resolve and trickery these very talented musicians possess just to bring these songs up to a minimally acceptable standard. The end result is an album I found more satisfying than At Mount Zoomer, but not by much. Boeckner's Cars-like Palm Road and Krug's epic closer Cave-O-Sapien are the clear standouts, but I also enjoyed Ghost Pressure. Additionaly, What Did My Lover Say, Little Golden Age, and Pobody's Nerfect, though inconsistent tracks, all present moments of unfettered brilliance. But after that, there's little here that's anywhere near the standard set on Apologies To The Queen Mary. So if you're a devoted fan, don't hesitate, you'll enjoy this possibly final album, if for no other reason than Cave-O-Sapien puts such an fine exclamation point on the band's body of work. But if you're new to Wolf Parade, Apologies To The Queen Mary is the place to start. Cherry Picker's Best Bets: Palm Road , Little Golden Age , Ghost Pressure , Cave-O-Sapien . Here's a music only video for Cave-O-Sapien. 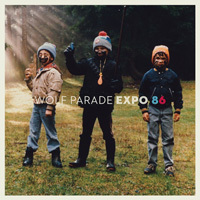 What are your thoughts on Wolf Parade's Expo 86? Let readers know with a comment.